I'll admit it; I'm a Theme Girl. I just can't stop myself from organizing my scrapbooking around themes. So I'm finding myself snapping photos each week concentrating on a particular activity without even meaning to. 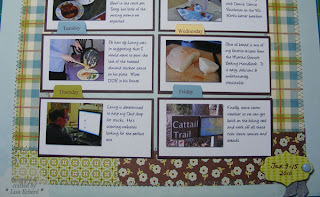 Last week was mostly food with a little exercise thrown in - just so we sound somewhat healthy. This week I'm already on a winter gardening kick. Diet (really???) 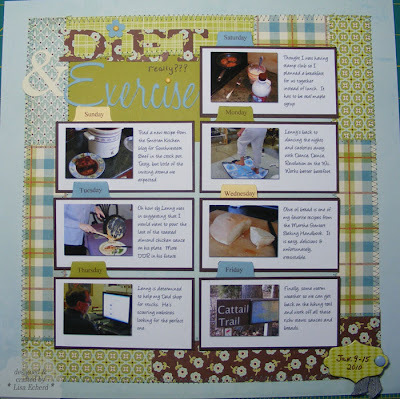 & Exercise is a one page layout - a rarety for me in our scrapbook. I also did something really unusual for me in that the photos are teany tiny - about 1 1/2" high. For some reason, I always scrapbook photos big enough to see from across the room. These show up just fine on the page and are plenty big enough. I mean, do we really need to see every crumb of my homemade bread? These sizes worked for my recipe card style layout. It has a lot of designer paper but I really love it. Perhaps it is because these are my favorite colors or maybe because there is a fair amount of white space around the photos given the details. Once again I cut letters with my Cricut using both the Plantin Schoolbook cartridge and the SCAL software. Before sewing, I adhered and trimmed all the pattern paper to a large scrap piece of cardstock for the frame. There is no stamping at all on this layout, not a bit of ink. Surprisingly, I'm not going through distressing withdrawal. Thanks for stopping by. Come back tomorrow for TIPsy Tuesday. Ingredients: Pattern Paper: Farm Fresh by October Afternoon with just one tiny piece of Basic Grey's Nook and Pantry.